This time last year, hardly anyone knew who Robert Galbraith was. The Cuckoo's Calling was just another crime novel, and its sequel, The Silkworm, should have passed off in the same way. But then it was leaked that Galbraith was in fact J.K. Rowling - yes, THAT J.K. Rowling - and the publication of The Silkworm became a huge event. I was lucky enough to get my hands on an advance copy of The Silkworm (while I was still two thirds of the way through reading The Cuckoo's Calling) and read the book in just under five hours. Luckily it's pacy with good characters and a compelling storyline, so my speed read (conducted at work, on a train, at midnight at home, then on another train early in the morning) was relatively painless (I'll admit to being a little bleary-eyed at work afterwards). 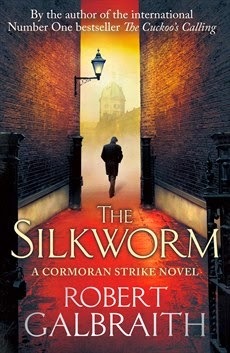 The Silkworm is the second book featuring war veteran and private detective Cormoran Strike. Having successfully discovered the murderer of a model in The Cuckoo's Calling, Strike's fortunes have changed - he's got plenty of well-paying clients and is no longer sleeping on a camp bed in his office. When a tearful woman turns up at his office, Strike finds himself delving into the case of an author who has gone missing after writing an unpublished book skewering everyone he knows. And when that author, Owen Quine, is found brutally murdered, the case takes a darker and more dangerous turn. Rowling is on fine form here, starting the novel with Strike meeting a sleazy tabloid reporter - in just a few pages Rowling makes clear her already well publicised feelings on the hacking scandal. It seems as though The Silkworm will follow the path its first chapter sets out, but instead Rowling chooses to focus on an industry much closer to home: publishing. As he finds out more about Quine's novel (titled Bombyx Mori - silkworm in Latin), Strike finds himself caught up in the world of publishing. As someone who's been working in the publishing industry for around eight months, I loved every bit of Strike's inauguration into a world so foreign from those he has previously encountered. He meets an agent, an editor, the head of a publishing company, and numerous people lower down the totem pole. While there are no easily identifiable figures from the world of UK publishing (at least, I can't see any), it's clear Rowling has taken stereotypes of publishing folk and used them to form her characters. So we have an eccentric battleaxe of an agent whose office is a mess of books, an editor who is all about books and not business and has turned to drink, writers whose egos are huge and who need mollycoddling, and a managing director who is cold and thinks about the bottom line first. For all her examination of publishing though, Rowling best sums it up when Strike says: "They love their bloody lunches, book people." Why yes, Strike, we bloody do! The mystery at the centre of The Silkworm is one that kept me guessing right until the very end, when Strike arranged a showdown with the murderer(s). It's clever, because there are only a certain number of people who could have killed Quine, so you have a narrow pool to guess from, but at any one time one of them could have done it, or none of them could have done it, or a few of them could have done it. However good the murder mystery is, The Silkworm is mostly as good as it is because Strike is such a complex and likeable character. He's stubborn, and can be stupid and a bit clueless emotionally at times, but you can't help but want to read more about what he's thinking, and you can't help but be awed at how clever his mind is at joining together the dots. The Silkworm is better than good when Strike is interacting with his assistant Robin. The pair's relationship has deepened since The Cuckoo's Calling, and they're on a much more even footing than they were in the first book. Both understand each other a lot more, and have fewer secrets. But as their relationship develops for the better, Robin's relationship with her fiance gets worse, which gives an interesting dynamic to the story. I like that this is a love triangle without being anything like a love triangle - the mutual respect and friendship between Strike and Robin are better than any cliched encounters. A year ago (yes, I'm back where I started), no one could have suspected that Rowling could write one good crime novel. The Silkworm proves that she can't - she can write at least two good crime novels, and if she carries on in this vein, the Cormoran Strike series will be talked about with the same enthusiasm that her Harry Potter novels are talked about. And we'll be doing that talking over lunch. •The Silkworm is released in the UK on June 19. How I got this book: From the publisher, Sphere. This did not affect my review.